For their second home game in a row, Preston Grasshoppers welcome Wharfedale to Lightfoot Green tomorrow. Having ended their three-match losing run last Saturday, Hoppers will now be seeking revenge for a 39-22 defeat in the Dales in October. 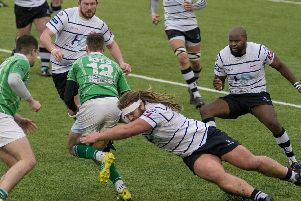 Preston are three places and six points ahead of 12th-placed Wharfedale, who have a game in hand and surprisingly toppled Hull Ionians, leaders of National League Two North, 24-12 last weekend. However, seven of the Dalesmen’s eight defeats out of 18 have come away from their Threshfield base, while seven of Hoppers’ eight victories in 17 games have been at Lightfoot Green. Hoppers head coach Paul Arnold drops himself to the bench, with Sale’s dual-registered Teddy Leatherbarrow coming into the back row and Ally Murray moving to lock. The backs remain unchanged, but Ollie Trippier returns on the bench, with Arnold naming four forward replacements. Vale of Lune chalked up their second successive home win in the North Premier League last weekend and are back at Powderhouse Lane again tomorrow to welcome seventh-placed Alnwick, before enjoying a Saturday off next weekend. Vale’s latest victory – their third in all, alongside two draws and 12 defeats – moved them above Kendal to third-from-bottom. Alnwick are on a four-match winning run and altogether have won 10 out of 17, including a 21-7 home victory over tomorrow’s hosts. With Ross Pillow and Andy Powers still sidelined through injury, Vale named an unchanged line-up. Fylde slipped a place to fourth last week and now face an intriguing home game against Tynedale. 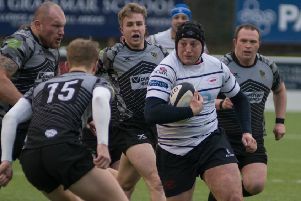 Not only did the North East outfit hammer second-placed Chester 25-5 last Saturday, they also inflicted by far Fylde’s biggest defeat of the campaign by 59-15 in October. Hoppers: Pope; Jordan, Hurst, Fitzpatrick, Spence; Davidson, Gough; Mabaya, Millea, Altham, Howard, Murray, Carlson, Leatherbarrow, Lamprey. Replacements: Miller, Trippier, Procter, Arnold, Stott. Vale: Ramwell; Fern, Owens, J Dorrington, Hall; B Dorrington, Swarbrick; Aualitia, Robinson, Yates, Foxcroft, Fellows, Fourie, Ayrton, Wallbank. Replacements: Stevens, Ford, Kyle.